Communities living near wood pellet production facilities have long called for reprieve from the dust that coats their homes and triggers respiratory illnesses. A new report from the Environmental Integrity Project, DIRTY DECEPTION: How the Wood Biomass Industry Skirts the Clean Air Act, confirms that these facilities are indeed releasing tons of soot particles that can trigger asthma and heart attacks, as well as carcinogens and smog-forming pollutants. Call on your Governor to take a stand against dirty biomass. The Environmental Integrity Project report highlights the widespread air quality violations in the biomass industry. The report’s authors examined federal and state records for 21 wood pellet plants from Virginia to Texas. 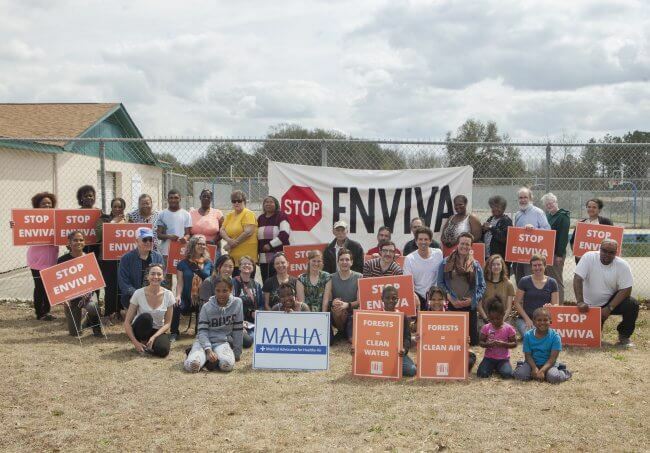 The results underline the need for decision-makers to take a hard look at the destruction of the wood pellet industry, hold companies like Enviva accountable for their pollution, and take a stand for true climate solutions and healthy communities. More than half of wood pellet plants in the U.S. either failed to keep emissions below legal limits or failed to install required pollution controls. One third of them (7 out of 21) violated their permits in 2017 by releasing illegal amounts of air pollution, while another four had faulty permits issued by states that failed to require pollution control equipment required by the federal Clean Air Act. Of the 15 largest operating wood pellet facilities, at least eight have had fires or explosions since 2014, including at factories in North Carolina, Georgia, Arkansas, Alabama, and Texas that released large amounts of air pollution and/or injured employees. 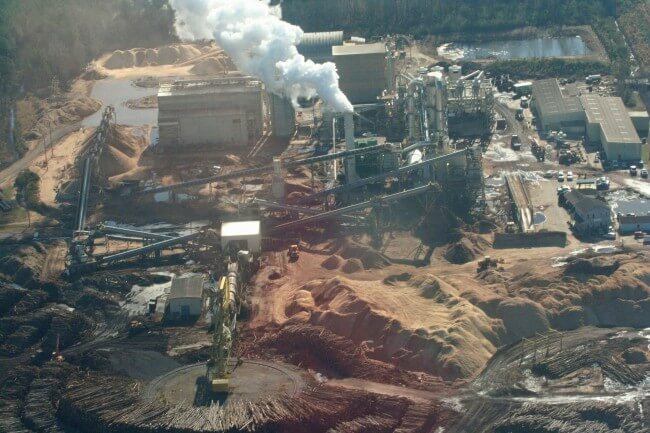 It should come as no surprise that North Carolina, home to three Enviva wood pellet facilities and a fourth underway, has been the most egregious in terms of allowing unnecessary and unlawful pollution from the industry. Due to North Carolina’s lax oversight and Enviva’s reluctance to install controls, the Enviva plants are the largest emitters of VOCs and hazardous air pollutants in the industry, emitting five to six times the level of VOCs and 50 times the level of hazardous air pollutants as comparable facilities. The industry’s troubling pattern of air quality violations adds yet another burden to communities who often face pollution from other extractive industries. New research shows that wood pellet facilities are 50% more likely to be located in Environmental Justice communities – counties where the poverty level is above the state medium, and at least 25% of the population is nonwhite. In North Carolina, every single wood pellet facility is located in a low-income, community of color. These wood pellet producers, like Enviva, and the state regulators who have permitted them, are knowingly allowing polluting facilities to skirt federal Clean Air Act requirements and put at risk communities who are the most vulnerable to the impacts of climate change and who have the least access to quality and affordable health care. This is unacceptable. Our communities and forests deserve better. Call on your state leaders to take a stand against dirty biomass. It is time for states to pump the brakes on an industry that has been deceiving investors, decision-makers, and communities from day one. Our state officials, armed with this new knowledge, should hold the biomass industry accountable and do right by communities. We call on state officials to fix permit and compliance issues, ensure that facilities install best available pollution controls, and halt the expansion of this industry. This is beyond atrocious! 45 has done nothing but deregulate the positive actions of President Obama and he continues to destroy our Country and our World!!! The PEOPLE must stand together and stop this madness of destroying our world and air for all human beings. Surely these companies can be regulated to the point their R&D Departments would be forced to find a better alternative disposal system. Please work for clean environment in every eat. This company is deceptive and criminal in their pollution violations, not to mention consuming our forests. Make them comply or shut down.